It probably isn’t fair (and it may not even be accurate) to call every first person puzzle game “Portal-like,” but given the popularity of Valve’s puzzle series, which like all of its others is stalled at 2, I wouldn’t call the comparison a stigma that developers should avoid. Indeed, being in the company of Portal should be considered a badge of honor, especially when the comparison is coming from yours truly. The esteem in which I hold Portal is incredibly high – I was that guy who was wearing out the references and in-jokes at every opportunity to everyone who I even suspected might get it, you see. I said all of that so I could say this: it is with great adulation that I call the Turing Test a Portal-like, first-person puzzle game that does for beauty and philosophical thinking what Portal did for black comedy. The game opens with the protagonist, Ava Turing, being gently awakened by the soothing voice of the ship’s friendly AI, T.O.M. Coming out of a cryogenic sleep aboard a spaceship orbiting Jupiter’s moon, Europa, Ava is given the immediate assignment of flying a landing pod down to the surface to investigate the radio silence from the rest of the ship’s crew. Since the crew landed ahead of Ava and placed her in cryogenic sleep so she could take a “shift” a few years later, their lack of communication has worried T.O.M. and he needs Ava to find out what’s going on. He is, after all, just an AI, and even with control of the ship’s systems and a handful of his friendly little droid-like mobile units, there’s only so much he can do to look into things. The opening actually gave me a very nostalgic vibe and made me think of the original Alien film and its more recent companion video game, Isolation, and I found the subtle nod quite welcome. 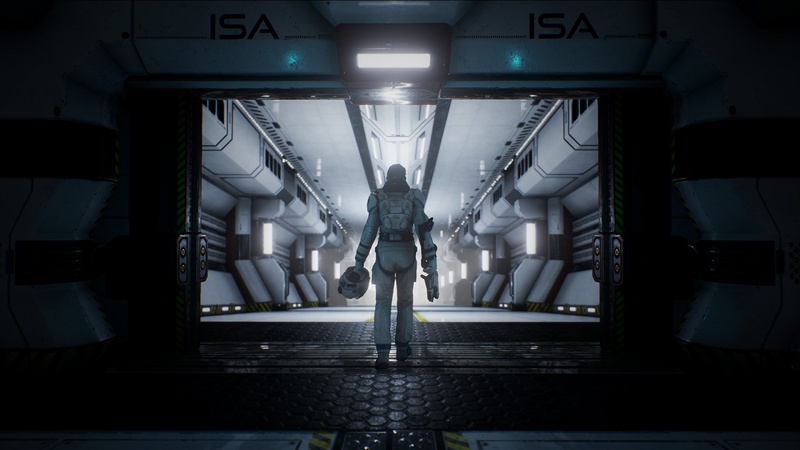 The funny thing about reviewing a game like The Turing Test is that, rather than express my fondness for Alien and references to it, there is no shortage of other ways I could end that last paragraph to lead you into suspecting any number of things about the inherent mystery of the game, but I feel like doing so would be a disservice to the wonder and curiosity that the entire experience so inspires. It is rare that a game has such fun and engaging puzzle solving mechanics that are yet completely overshadowed by the story it tells. I draw the Portal comparison for a few reasons, but like Portal’s protagonist Chell and her Portal gun, Ava wields a wonderful piece of science fiction called the Energy Manipulation Tool. The EMT allows her to collect and distribute energy charges back and forth to various nodes throughout the planet-side base, using the charges to unlock doors and progress through a series of puzzle chambers. As you play through chamber after chamber, different elements are gradually introduced, like “flickering” charges that act like repeating on/off switches in the nodes to which they’re distributed. Pressure plates and weighted batteries (which are delightfully cubed, although not good companions) are par for the course, as well as control panels to slide various pieces of equipment around to enable your advancement in the game. 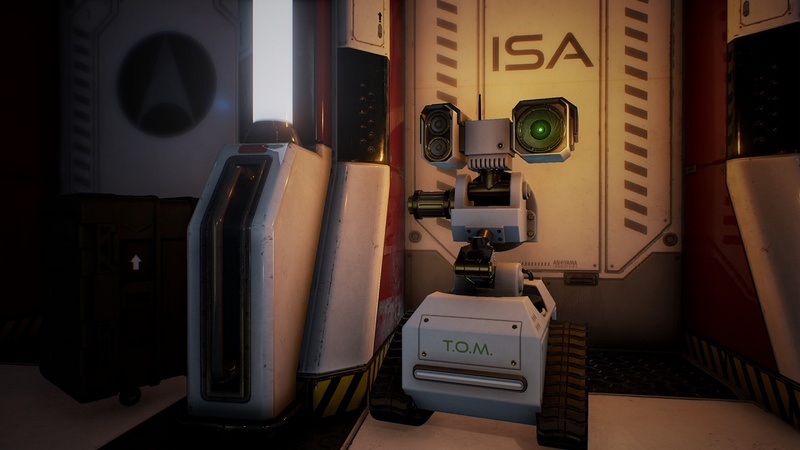 All of those elements are tremendously fun to manipulate, yet the entire time I played, I was compelled to complete the puzzles simply so I could learn more about the haunting world that The Turing Test creates. Space exploration and otherworldly moons and planets are themselves a mystery to us, and what can be more mysterious than a mystery within that mystery? Don’t worry – I’m not writing this from a Starbucks on a MacBook, so the entire experience of reviewing The Turing Test hasn’t transformed me into a hipster yet. 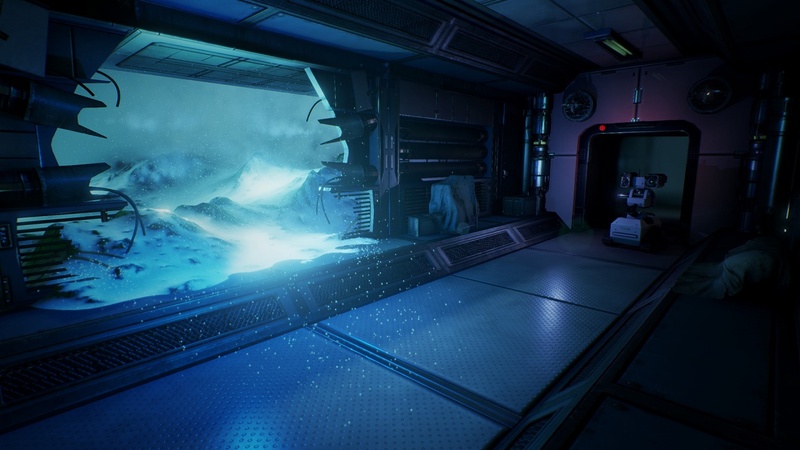 Crafted in Unreal Engine 4, the game is visually quite impressive, and certainly on par with at least it peers in puzzle-solving. There is a great attention to detail to be found on the ship and in the facility, with numerous items able to be examined up close…and then neatly set back down instead of being thrown and strewn all across the room. Apparently Ava likes to keep her workplace neat and tidy. I can’t say that it’s on par with bleeding edge graphical juggernauts on PC and console, but it’s still a beautiful game in more ways than just concept and execution, and a large contributor to that is the graphical design. Graphical design and sound design, that is. The voice acting in The Turing Test is superb. 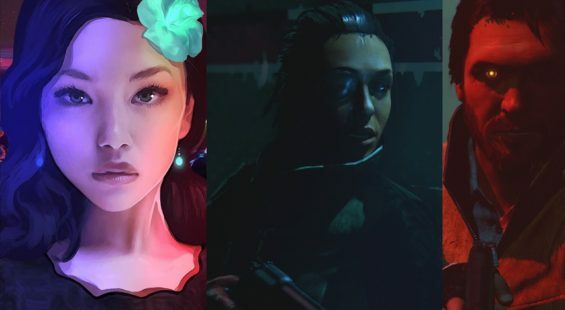 Although Ava’s and T.O.M.’s voice actors carry the vast majority of the game’s dialogue, the other voice actors do a fine job in their roles and, to their credit, had to convey a much wider range of emotions in their performances. The sound effects are all suitable and appropriate for their environment, but what really captivated me was the music, which, to use the word again, was positively haunting. Sometimes eerie and ominous, sometimes beguiling and alluring, the music in The Turing Test is always there, almost a third presence in the otherwise mostly empty rooms populated by only Ava and the disembodied voice of T.O.M. Truthfully, I have a hard time evaluating The Turing Test for its length. It is a fairly short game, lasting probably just two to four hours depending on your personal aptitude solving puzzles. 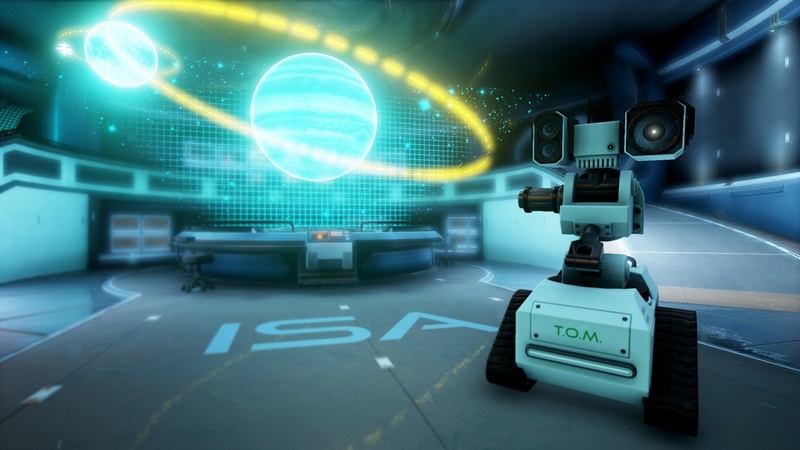 If you tackle the “secret” puzzles between some of the puzzle chambers (which I do highly recommend as they are a treasure trove of plot details), that may push your game timer closer to that four hour mark, but The Turing Test is still a very fleeting experience. 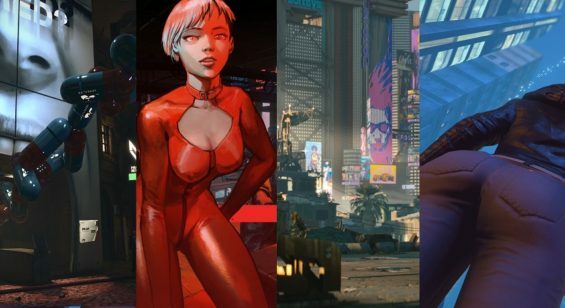 Of course, the pacing of the game feels practically perfect to me, which makes me believe that if the game actually were longer, it might make the experience feel somewhat padded or less meaningful. I would absolutely like to have more content, but only if enough significant dialogue and exposition could be created for the additional puzzle chambers, since for me, they were a means to the end of the story. 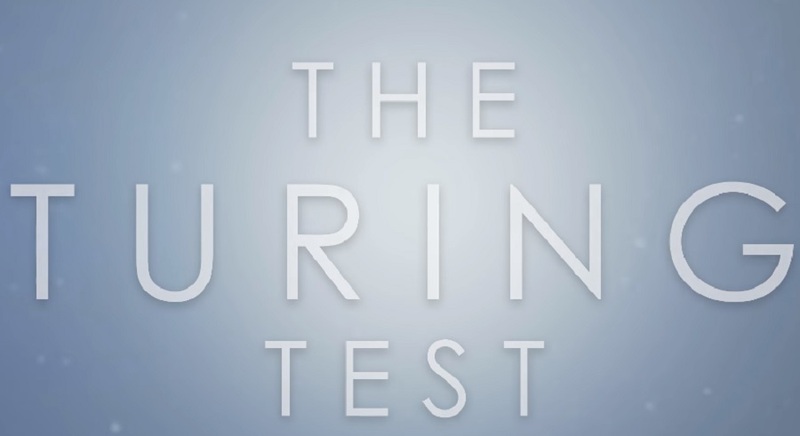 At the end of the day, I can’t recommend The Turing Test enough. It definitely won’t appeal to everyone, but to anyone with a sense of wonder, exploration, or even those of us with an investigative streak, it is an experience unlike few others available on the Xbox One or PC.